Don’t Bring Your Momma’s Tack Hammer!! Always return a tool in better shape than it was in when you borrowed it. I sawed it off twice and it’s still too short. Hallerin Hilton Hill had a caller this morning on his radio talk show who related a story about his father. His father was a life-long carpenter. The caller told us how, from the time he was thirteen, he spent his summers helping his father; getting yanked out of bed early, toting 2 x 4 ‘s, driving nails, etc. He worked and earned his own money. He even bought his own school clothes throughout his years in middle school and high school. That work ethic is with him to this day. I especially like the part of the story where he talked about his dad‘s method of interviewing possible new crew members. Of course, they would always claim to have many years of experience framing houses, building decks, etc. His dad would shrug that off and simply ask to see the guy’s hammer. I guess it was pretty obvious by looking at the guy’s hammer what kind of experience he had? 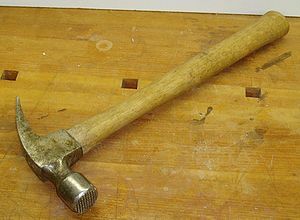 The caller told how once, his dad even turned and threw the guys hammer into the river and said something like, “Boy, don’t ever bring your mamma’s tack hammer to a carpenter’s job interview!” I guess the guy probably didn’t get the job. We need parents in this country who take the time to teach their kids real values, life skills, and common sense; to teach them how to get up when they fall down. We need our grandfather’s wisdom to be passed down again. Our country needs Americans who believe in hard work, in earning what you get, who have the gumption to get back up if they get knocked down, and who love their country! We already have more than enough parasites who hope to fundamentally transform our country so they can simply lay back and suckle at the government’s teat … or folks who show up with their momma’s tack hammer and expect $80,000 a year! Previous PostBlack Democratic Congressman Joins Republican Party!Next PostA Flash of Stupidity in a Lifetime of Ineptitude!